My second week in Bologna, and I’m really getting into the swing of La Dolce Vita. Explore, Eat, Exercise, Repeat. All my favourite ‘e’s, performed religiously each day in Bologna, not necessarily in that order. I even enrolled myself in a couple of cooking classes. 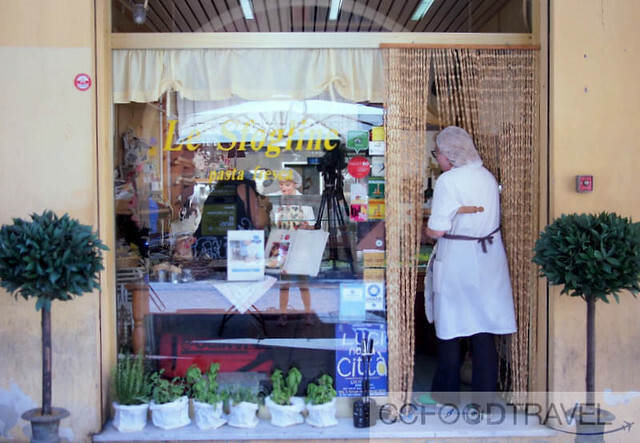 Because you see, in Bologna, this is the done thing – as there are many small family-owned shops where fresh pasta is made daily. And who better to learn from, than the pro’s themselves. Today we visit a famous pastificio in Bologna, and meet Monica, who has been making pasta for years, and she shows us how to make pasta fresca, starting with the dough. She combines flour and fresh eggs, kneading the dough on a floured table—if you’ve never made pasta, you can learn how to mound the flour and whisk in the eggs like an expert. It was an exciting lesson with Monica of Le Sfogline, where we learned the fine art of rolling, stuffing, and shaping these fetching little dumplings, all for the eventual goal of serving them on a plate, as part of lunch or dinner. No matter how tricky the tortellini look, we became pasta-making pros once we learned how to mould and bend pasta to our will! Le Sfogline on Via Belvedere is a rather quaint and cool little shop, which is really a fresh pasta factory that’s located opposite the Herb Market in Bologna. The best things to eat here include, the Tortellini, tortelloni, lasagna, gnocchi, ravioli and rice cakes which have been prepared fresh, every day for nearly two decades now. It’s really worth learning from the best, and you will not regret enrolling for Monica’s pasta making class if you ever visit Bologna. Keep the pasta covered – after you have made the dough, cover your pasta and let it rest for 1 hour. This makes the dough soft and pliable. Pasta actually dries out surprisingly quickly if left uncovered, which makes it difficult to work with and prone to tearing. Keep both the remaining pieces of dough, the rolled out sheets of pasta, and the shaped tortellini covered with a piece of plastic wrap or a clean dish towel. Remember, the dough is pliable but does not easily break, so get used to stretching it around the filling. I was initially scared to stretch it over the ricotta cheese, but soon got used to it. Don’t over-stuff your pasta – over-stuffing makes it messy and difficult to seal the tortellini and leads to dumplings that burst in the cooking pot. Stick to about 1 teaspoon of filling more or less, for a 3″ pasta. 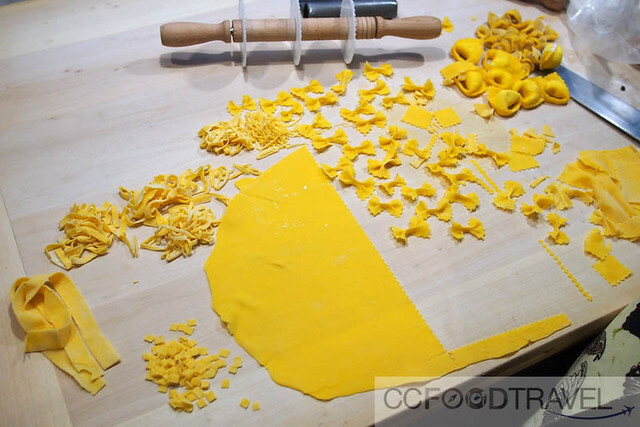 Use ample flour – Ironically for something that dries out so quickly, the shaped tortellini love to stick to the tray and to each other. Be sure to keep both the tray and the tortellini dusted with a good amount of flour and don’t let the tortellini touch once you’ve shaped them. Give yourself enough time – Making tortellini is definitely not hard, but it takes practice! Cut the sheet of pasta into squares roughly 3-inches by 3-inches. Place 1 teaspoon of filling in the middle of each square of pasta. Dip your finger in the bowl and run it along two edges of the square. Fold the square into a triangle, pressing the top together and then working your way along the sides. Fold the pocket of filling upward toward the peak of the triangle. Hold the triangle up right, stuffing at the base – squeeze both ends of the triangle between your index finger and thumb on both sides, while wrapping the flaps around your thumb, so it forms a nice hole. 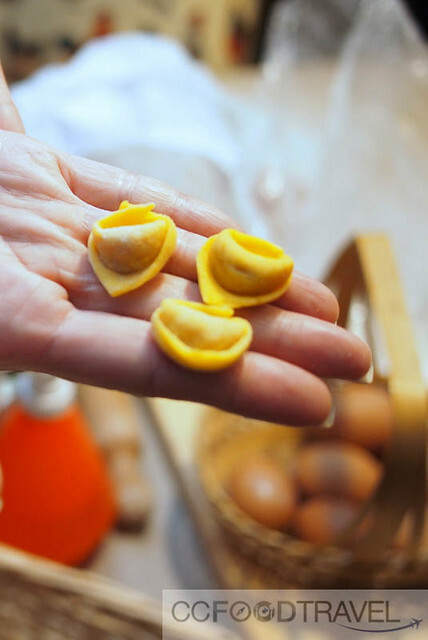 This is the characteristic shape of the tortellini as well as tortelloni. You should be wrapping the two corners around your finger in one swift motion. Of course Monica does it like a pro.. we eventually got the hang of it. Don’t forget to press tightly to seal, so it doesn’t come loose and lose its shape in the hot water. Toss with flour, set aside on well-floured baking sheet, and cover. Repeat with remaining pieces of dough. 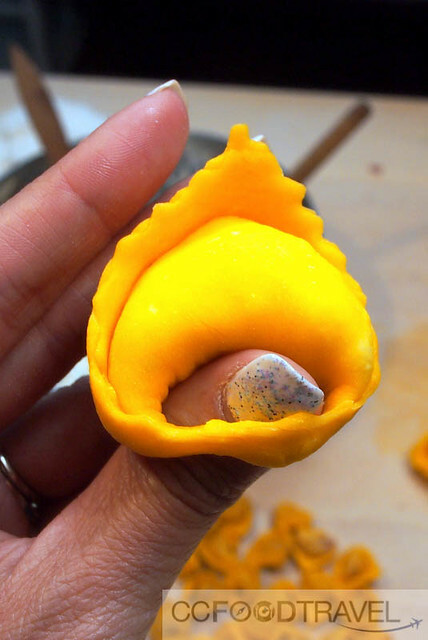 Tortellini can be filled with anything from plain ricotta cheese to cooked sausage. There are no rules really. If you’re experimenting with making tortellini without a recipe, start with 2 cups (20 ounces) ricotta as your base and add other cheese, cooked meats, herbs, or seasonings to taste. If you like meat, seasoned minced pork would be a fabulous option. Cooking the tortellini: Bring a large pot of water to a boil and add a tablespoon or two of salt. Lower the tortellini into the water a few at a time with a slotted spoon. Stir the pot occasionally to prevent the tortellini from sticking to the pot or each other. Cook until all the tortellini have bobbed to the surface of the water, about 5 minutes. Taste one to check for doneness. My trip to Emilia Romagna is part of the #Blogville campaign, a collaboration between the Emilia Romagna Region Tourist Board and iAmbassador. As always, CCFoodTravel maintains full editorial control over the blog.